So I have an addiction you see... of the lip kind. And sometimes, it can be pretty bad! Me and my chapstick, lip gloss, lip balm, whatever you want to call it are like a baby and his pacifier. I have about five stashed away in hidden spots at any given time. Some so hidden that sometimes I forget about them and it's not until I randomly find them again that I realize I didn't actually need another three. Not that I ever regret buying new ones because one can never have too many really. When I do find those long lost ones, man oh my it's like finding forgotten cash in your pockets! I am dead serious here guys. I try to have one in my purse at all times, but you know switching around purses can get tricky sometimes and it does happen that I end up without one from time to time. As soon as I realize though, I will be licking my lips non stop and itching for the next CVS to buy a replacement pronto... it's that bad. 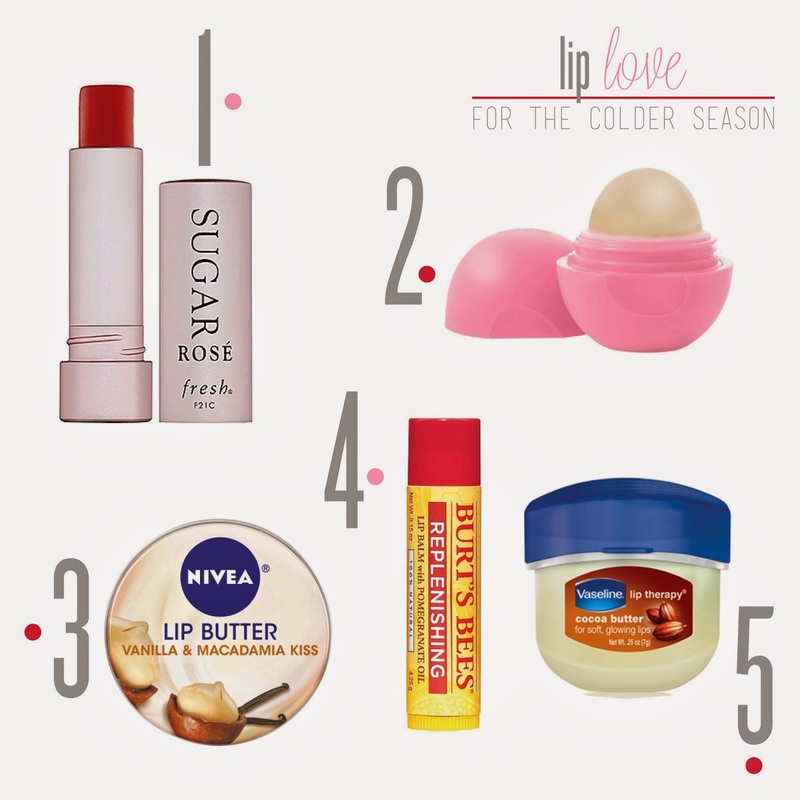 Of course winter time is no help and so I thought I'd share with you all a few of my favorites at the moment. Some are a little pricier and I save for special occasions (yes chapsticks for special occasions, I said it) while others are more affordable and my day to day staple. Oh and hubs just discovered the other day that I sleep with a chapstick under my pillow... I mean it's like he doesn't even know me! 1 / Fresh Sugar Lip Treatment in Rose: Definitely one of my favorites and has quickly become my go to when I want to add a little color to my lips without the fuss or commitment of regular lipsticks. It doesn't feel greasy or sticky and you can layer to up the hint of color. A bit of a splurge but once you've tried it, you'll understand why... feels like butter! 2 / EOS Organic Lip Balm Sphere in Strawberry Sorbet: These kind of remind me of little macaroons in their pastel colors and round shapes. The good news, these taste as yummy as they smell so that's a plus if you're a lip licker like me! Very easy to apply but I did find myself needing to re-apply more often than I'd like. 3 / Nivea Lip Butter in Vanilla & Macadamia Kiss: Can we say yum! It takes will power not to lick this one straight out of the tin... but unfortunately it doesn't taste like anything. It goes on light but hydrates plenty and lasts for hours. I like how smooth my lips feel when I've used this one and hubs has ranked it as kissable. 4 / Burt's Bees Lip Balm in Pomegranate Oil: Made with all natural ingredients which is a plus for anyone with sensitive lips. This one glides on easily and smells lovely. I like that it doesn't feel waxy like some other chap sticks do and actually lasts pretty well. I'd say its pretty good value! 5 / Vaseline Lip Therapy in Cocoa Butter: I have to admit, what sold me instantly on this one is the cute little tub! It's the perfect size to toss in your purse or keep under your pillow (yes, I do that!). This balm is thick and smooth but not in a greasy way. It has a nutty smell that I love and leaves your lips feeling kissable instantly!